What is the skill set users need to use it? What platforms/languages do people need to know in order to modify or integrate it with other tools? How is it better than the current state of the art? How would someone get it? Is a user account required? Are all of its components/dependencies easy to find? How would someone install it? Can anyone install it? Do they need IT help? Does this process actually work? All the time? On all systems specified? How would someone test that it's working with provided sample data? Is the "using" of sample data clear? How would someone use it with their own data? Gunrock is a CUDA library for graph-processing designed specifically for the GPU. It uses a high-level, bulk-synchronous, data-centric abstraction focused on operations on a vertex or edge frontier. Gunrock achieves a balance between performance and expressiveness by coupling high performance GPU computing primitives and optimization strategies with a high-level programming model that allows programmers to quickly develop new graph primitives with small code size and minimal GPU programming knowledge. For more details, please visit our website, read Why Gunrock, our TOPC 2017 paper Gunrock: GPU Graph Analytics, look at our results, and find more details in our publications. See Release Notes to keep up with the our latest changes. Gunrock is featured on NVIDIA's list of GPU Accelerated Libraries as the only external library for GPU graph analytics. For Frequently Asked Questions, see the FAQ. For information on building Gunrock, see Building Gunrock. The "examples" subdirectory included with Gunrock has a comprehensive test application for most the functionality of Gunrock. For the programming model we use in Gunrock, see Programming Model. We have also provided code samples for how to use Gunrock's C interface and how to call Gunrock primitives from Python, as well as annotated code for two typical graph primitives. For details on upcoming changes and features, see the Road Map. We are gradually adding summaries of our results to these web pages (please let us know if you would like other comparisons). These summaries also include a table of results along with links to the configuration and results of each individual run. We detail our methodology for our measurements here. For reproducibility, we maintain Gunrock configurations and results in our github gunrock/io repository. We are happy to run experiments with other engines, particularly if those engines output results in our JSON format / a format that can be easily parsed into JSON format. To report Gunrock bugs or request features, please file an issue directly using Github. Thanks to the following developers who contributed code: The connected-component implementation was derived from code written by Jyothish Soman, Kothapalli Kishore, and P. J. Narayanan and described in their IPDPSW '10 paper A Fast GPU Algorithm for Graph Connectivity (DOI). The breadth-first search implementation and many of the utility functions in Gunrock are derived from the b40c library of Duane Merrill. The algorithm is described in his PPoPP '12 paper Scalable GPU Graph Traversal (DOI). Thanks to Erich Elsen and Vishal Vaidyanathan from Royal Caliber and the Onu Team for their discussion on library development and the dataset auto-generating code. Thanks to Adam McLaughlin for his technical discussion. Thanks to Oded Green for his technical discussion and an optimization in the CC primitive. Thanks to the Altair and Vega-lite teams in the Interactive Data Lab at the University of Washington for graphing help. We appreciate the technical assistance, advice, and machine access from many colleagues at NVIDIA: Chandra Cheij, Joe Eaton, Michael Garland, Mark Harris, Ujval Kapasi, David Luebke, Duane Merrill, Josh Patterson, Nikolai Sakharnykh, and Cliff Woolley. This work was funded by the DARPA HIVE program under AFRL Contract FA8650-18-2-7835, the DARPA XDATA program under AFRL Contract FA8750-13-C-0002, by NSF awards OAC-1740333, CCF-1629657, OCI-1032859, and CCF-1017399, by DARPA STTR award D14PC00023, and by DARPA SBIR award W911NF-16-C-0020. Our XDATA principal investigator was Eric Whyne of Data Tactics Corporation and our DARPA program manager is Mr. Wade Shen (since 2015), and before that Dr. Christopher White (2012–2014). Thanks to Chris, Wade, and DARPA business manager Gabriela Araujo for their support during the XDATA program. Gunrock is copyright The Regents of the University of California, 2013–2018. The library, examples, and all source code are released under Apache 2.0. Gunrock's current release has been tested on Linux Mint 15 (64-bit), Ubuntu 12.04, 14.04 and 15.10 with CUDA 7.5 installed, compute architecture 3.0 and g++ 4.8. We expect Gunrock to build and run correctly on other 64-bit and 32-bit Linux distributions, Mac OS, and Windows. CUDA (7.5 or higher) is used to implement Gunrock. Refer to NVIDIA's CUDA homepage to download and install CUDA. Refer to NVIDIA CUDA C Programming Guide for detailed information and examples on programming CUDA. Boost (1.58 or higher) is used for for the CPU reference implementations of Connected Component, Betweenness Centrality, PageRank, Single-Source Shortest Path, and Minimum Spanning Tree. Refer to Boost Getting Started Guide to install the required Boost libraries. Alternatively, you can also install Boost by running /gunrock/dep/install_boost.sh script (recommended installation method). Ideal location for Boost installation is /usr/local/. If the build cannot find your Boost library, make sure a symbolic link for boost installation exists somewhere in /usr/ directory. ModernGPU and CUB used as external submodules for Gunrock's APIs. METIS is used as one possible partitioner to partition graphs for multi-gpu primitives implementations. Alternatively, you can also install METIS by running /gunrock/dep/install_metis.sh script. If the build cannot find your METIS library, please set the METIS_DLL environment variable to the full path of the library. Binary test files are available in build/bin directory. You can either run the test for all primitives by typing make check or ctest in the build directory, or do your own testings manually. Detailed test log from ctest can be found in /build/Testing/Temporary/LastTest.log, alternatively you can run tests with verbose option enabled ctest -v.
GUNROCK_BUILD_LIB (default: ON) - Builds main gunrock library. GUNROCK_BUILD_SHARED_LIBS (default: ON) - Turn off to build for static libraries. GUNROCK_MGPU_TESTS (default: OFF) - If on, tests multiple GPU primitives with ctest. GUNROCK_GENCODE_SM<> (default: GUNROCK_GENCODE_SM30,35,61=ON) change to generate code for a different compute capability. CUDA_VERBOSE_PTXAS (default: OFF) - ON to enable verbose output from the PTXAS assembler. All dataset-related code is under the gunrock/dataset/ subdirectory. The current version of Gunrock only supports Matrix-market coordinate-formatted graph format. The datasets are divided into two categories according to their scale. Under the dataset/small/ subdirectory, there are trivial graph datasets for testing the correctness of the graph primitives. All of them are ready to use. Under the dataset/large/ subdirectory, there are large graph datasets for doing performance regression tests. * To download them to your local machine, just type make in the dataset/large/ subdirectory. * You can also choose to only download one specific dataset to your local machine by stepping into the subdirectory of that dataset and typing make inside that subdirectory. Laboratory Tested Hardware: Gunrock with GeForce GTX 970, Tesla K40s. We have not encountered any trouble in-house with devices with CUDA capability >= 3.0. Gunrock is a stable, powerful, and forward-looking substrate for GPU-based graph-centric research and development. Like many graph frameworks, it leverages a bulk-synchronous programming model and targets iterative convergent graph computations. We believe that today Gunrock offers both the best performance on GPU graph analytics as well as the widest range of primitives. Gunrock has the best performance of any programmable GPU+graph library. Gunrock primitives are an order of magnitude faster than (CPU-based) Boost, outperform any other programmable GPU-based system, and are comparable in performance to hardwired GPU graph primitive implementations. When compared to Ligra, a best-of-breed CPU system, Gunrock currently matches or exceeds Ligra's 2-CPU performance with only one GPU. Gunrock's abstraction separates its programming model from the low-level implementation details required to make a GPU implementation run fast. Most importantly, Gunrock features very powerful load-balancing capabilities that effectively address the inherent irregularity in graphs, which is a problem we must address in all graph analytics. We have spent significant effort developing and optimizing these features---when we beat hardwired analytics, the reason is load balancing---and because they are beneath the level of the programming model, improving them makes all graph analytics run faster without needing to expose them to programmers. Gunrock's data-centric programming model is targeted at GPUs and offers advantages over other programming models. Gunrock is written in a higher-level abstraction than hardwired implementations, leveraging reuse of its fundamental operations across different graph primitives. Gunrock has a bulk-synchronous programming model that operates on a frontier of vertices or edges; unlike other GPU-based graph analytic programming models, Gunrock focuses not on sequencing computation but instead on sequencing operations on frontier data structures. This model has two main operations: compute, which performs a computation on every element in the current frontier, and traversal, which generates a new frontier from the current frontier. Traversal operations include advance (the new frontier is based on the neighbors of the current frontier) and filter (the new frontier is a programmable subset of the current frontier). We are also developing new Gunrock operations on frontier data structures, including neighbor, gather-reduce, and global operations. This programming model is a better fit to high-performance GPU implementations than traditional programming models adapted from CPUs. Specifically, traditional models like gather-apply-scatter (GAS) map to a suboptimal set of GPU kernels that do a poor job of capturing producer-consumer locality. With Gunrock, we can easily integrate compute steps within the same kernels as traversal steps. As well, Gunrock's frontier-centric programming model is a better match for key optimizations such as push-pull direction-optimal search or priority queues, which to date have not been implemented in other GPU frameworks, where they fit poorly into the abstraction. Gunrock supports more primitives than any other programmable GPU+graph library. We currently support a wide variety of graph primitives, including traversal-based (breadth-first search, single-source shortest path); node-ranking (HITS, SALSA, PageRank); and global (connected component, minimum spanning tree). Many more algorithms are under active development (including graph coloring, maximal independent set, community detection, and graph matching). Gunrock has better scalability with multiple GPUs on a node than any other graph library. We not only show better BFS performance on a single node than any other GPU framework but also outperform other frameworks, even those customized to BFS, with up to four times as many GPUs. More importantly, our framework supports all Gunrock graph primitives rather than being customized to only one primitive. Gunrock's programming model scales to multiple GPUs while still using the same code as a single-GPU primitive. Other frameworks require rewriting their primitives when moving from one to many GPUs. Gunrock's multi-GPU programming model uses single-node Gunrock code at its core so that single-GPU and multi-GPU operations can share the same codebase. We welcome comments from others on the methodology that we use for measuring Gunrock's performance. Currently, Gunrock is a library that requires no preprocessing. By this we mean that Gunrock inputs graphs in a "standard" format, e.g., compressed sparse row or coordinate, such as those available on common graph repositories (SNAP or SuiteSparse (UF)). In our experiments, we use MatrixMarket format. Other graph libraries may benefit from preprocessing of input datasets. We would regard any manipulation of the input dataset (e.g., reordering the input or more sophisticated preprocessing such as graph coloring or CuSha's G-Shards) to be preprocessing. We think preprocessing is an interesting future direction for Gunrock, but have not yet investigated it. We hope that any graph libraries that do preprocessing report results with both preprocessed and unmodified input datasets. Throughput, measured in edges traversed per second (TEPS). We generally use millions of TEPS (MTEPS) as our figure of merit. Runtime, typically measured in ms. We measure runtime entirely on the GPU, with the expectation that the input data is already on the GPU and the output data will be stored on the GPU. This ignores transfer times (either disk to CPU or CPU to GPU), which are independent of the graph analytics system. It is our expectation that GPU graph analytics will be most effective when (a) they are run on complex primitives and/or (b) run on sequences of primitives, either of which would mitigate transfer times. GPU graph analytics are likely not well suited to running one single simple primitive; for a simple primitive like BFS, it is more expensive to transfer the graph from CPU to GPU than it is to complete the BFS. To calculate TEPS, we require the number of edges traversed (touched), which we count dynamically. For traversal primitives, we note that non-connected components will not be visited, so the number of visited edges may be fewer than the number of edges in the graph. We note that precisely counting edges during the execution of a particular primitive may have performance implications, so we may approximate (see BFS). Notes on specific primitives follow. When we count the number of edges traversed, we do so by summing the number of outbound edges for each visited vertex. For forward, non-idempotent BFS, this strategy should give us an exact count, since this strategy visits every edge incident to a visited vertex. When we enable idempotence, we may visit a node more than once and hence may visit an edge more than once. For backward (pull) BFS, when we visit a vertex, we count all edges incoming to that vertex even if we find a visited predecessor before traversing all edges (and terminate early). (To do so otherwise has performance implications.) Enterprise uses the same counting strategy. If a comparison library does not measure MTEPS for BFS, we compute it by the number of edges visited divided by runtime; if the former is not available, we use Gunrock's edges-visited count. In general we find MTEPS comparisons between different approaches to SSSP not meaningful: because an edge may be visited one or many times, there is no standard way to count edges traversed. Different algorithms may not only visit a very different number of edges (Dijkstra vs. Bellman-Ford will have very different edge visit counts) but may also have a different number of edges visited across different invocations of the same primitive. When we report Gunrock's SSSP MTEPS, we use the number of edges queued as the edge-traversal count. To have a meaningful SSSP experiment, it is critical to have varying edge weights. SSSP measured on uniform edge weights is not meaningful (it becomes BFS). In our experiments, we set edge weights randomly/uniformly between 1 and 64. If a comparison library does not measure MTEPS for BC, we compute it by twice the number of edges visited in the forward phase divided by runtime (the same computation we use for Gunrock). This page describes the programming model we use in Gunrock. Gunrock targets graph computations that are generally expressed as "iterative convergent processes". By "iterative," we mean operations that may require running a series of steps repeatedly; by "convergent," we mean that these iterations allow us to approach the correct answer and terminate when that answer is reached. Many graph-computation programming models target a similar goal. Many of these programming models focus on sequencing steps of computation. Gunrock differs from these programming models in its focus on manipulating a data structure. We call this data structure a frontier of vertices or edges. The frontier represents the subset of vertices or edges that is actively participating in the computation. Gunrock operators input one or more frontiers and output one or more frontiers. Generically, graph operations can often be expressed via a push abstraction (graph elements "push" local private updates into a shared state) or a pull abstraction (graph elements "pull" updates into their local private state) (Besta et al. publication on push-vs.-pull, HPDC '17). Gunrock's programming model supports both of these abstractions. (For instance, Gunrock's direction-optimized breadth-first-search supports both push and pull BFS phases. Mini-Gunrock supports pull-based BFS and PR.) Push-based approaches may or may not require synchronization (such as atomics) for correct operation; this depends on the primitive. Gunrock's idempotence optimization (within its BFS implementation) is an example of a push-based primitive that does not require atomics. In the current Gunrock release, we support four operators. Advance: An advance operator generates a new frontier from the current frontier by visiting the neighbors of the current frontier. A frontier can consist of either vertices or edges, and an advance step can input and output either kind of frontier. Advance is an irregularly-parallel operation for two reasons: 1)~different vertices in a graph have different numbers of neighbors and 2)~vertices share neighbors. Thus a vertex in an input frontier map to multiple output items. An efficient advance is the most significant challenge of a GPU implementation. Filter: A filter operator generates a new frontier from the current frontier by choosing a subset of the current frontier based on programmer-specified criteria. Each input item maps to zero or one output items. Compute: A compute operator defines an operation on all elements (vertices or edges) in its input frontier. A programmer-specified compute operator can be used together with all three traversal operators. Gunrock performs that operation in parallel across all elements without regard to order. Segmented intersection: A segmented intersection operator takes two input node frontiers with the same length, or an input edge frontier, and generates both the number of total intersections and the intersected node IDs as the new frontier. Cond Functor: Cond functors input either a vertex id (as in VertexCond) or the source id and the dest id of an edge (as in EdgeCond). They also input data specific to the problem being solved to decide whether the vertex or the edge is valid in the outgoing frontier. Apply Functor: Apply functors take the same set of arguments as Cond functors, but perform user-specified computation on the problem-specific data. To create a new graph primitive, we first put all the problem-specific data into a data structure. For BFS, we need a per-node label value and a per-node predecessor value; for CC, we need a per-edge mark value, a per-node component id value, etc. Then we map the algorithm into the combination of the above three operators. Next, we need to write different functors for these operators. Some graph algorithms require only one functor (BFS), but some graph algorithms need more (CC needs seven). Finally, we write an enactor to load the proper operator with the proper functor. We provide a graph primitive template. The problem, functor, and enactor files are under gunrock/app/sample, and the driver code is under tests/sample. Transitioning over from Git Branching Workflow suggested by Vincent Driessen at nvie to Git Forking Workflow for Gunrock. When they're ready to publish a local commit, they push the commit to their own public repository—not the official one. Then, they file a pull request with the main repository, which lets the project maintainer know that an update is ready to be integrated. The pull request also serves as a convenient discussion thread if there are issues with the contributed code. To integrate the feature into the official codebase, the maintainer pulls the contributor’s changes into their local repository, checks to make sure it doesn’t break the project, merges it into his local master branch, then pushes the master branch to the official repository on the server. The contribution is now part of the project, and other developers should pull from the official repository to synchronize their local repositories. Master Branch: Reserved only for final releases or some bug fixes/patched codes. Dev Branch: Current working branch where all developers push their changes to. This dev branch will serve as the "next release" gunrock, eliminating the need of managing individual branches for each feature and merging them when it is time for the release. Feature Branch: This is the developer's personal repository with their feature branch. Whatever changes they would like to contribute to gunrock must be in their own personal fork. And once it is time to create a pull request, it is done so using github pull request, a reviewer checks it and the changes are merged into gunrock/gunrock dev branch. Note that transitioning to this type of workflow from branching model doesn't require much effort, we will just have to start working on our forks and start creating pull requests to one dev branch. git remote set-url --push origin https://github.com/username/gunrock.git This insures that you are pulling from gunrock/gunrock (staying updated with the main repository) but pushing to your own fork username/gunrock. git commit -m "Describe your changes." Once you've pushed the changes on your fork, you can create a pull request on Github to merge the changes. Pull request will then be reviewed and merged into the dev branch. Recommended Read: Introduction: Why Google C++ Testing Framework? When writing a good test, we would like to cover all possible functions (or execute all code lines), what I will recommend to do is write a simple test, run code coverage on it, and use codecov.io to determine what lines are not executed. This gives you a good idea of what needs to be in the test and what you are missing. Coverage is the ratio of hits / (hit + partial + miss). A code base that has 5 lines executed by tests out of 12 total lines will receive a coverage ratio of 41% (rounding down). Below is an example of what lines are a hit and a miss; you can target the lines missed in the tests to improve coverage. Create a test_.h file and place it in the appropriate directory inside /path/to/gunrock/tests/. I will be using test_bfs_lib.h as an example. In the tests/test.cpp file, add your test file as an include: #include "bfs/test_lib_bfs.h". In your test_.h file, create a TEST() function, which takes two parameters: TEST(, ). Now when you run the binary called unit_test, it will automatically run your test suite along with all other google tests as well. This binary it automatically compiled when gunrock is built, and is found in /path/to/builddir/bin/unit_test. I highly recommend reading the Primer document mentioned at the start of this tutorial. It explains in detail how to write a unit test using google test. My tutorial has more been about how to incorporate it into Gunrock. Another interesting read is Measuring Coverage at Google. Framework: We are exploring more operators such as neighborhood reduction and segmented intersection. Generally we want to find the right set of operators that can abstract most graph primitives while delivering high performance. API: We would like to make an API refactoring to simplify parameter passing and to isolate parts of the library that dependencies are not necessary. The target is to make the frontier concept more clear, and to promote code reuse. Primitives: Our near-term goal is to graduate several primitives in dev branch including A* search, weighted label propagation, subgraph matching, triangle counting, and clustering coefficients; implement maximal independent set, max flow, and graph coloring algorithms, build better support for bipartite graph algorithms, and explore community detection algorithms. Our long term goals include algorithms on dynamic graphs, multi-level priority queue support, graph partitioning, and more flexible and scalable multi-GPU algorithms. Possible projects are in two categories: infrastructure projects that make Gunrock better but have minimal research value, and research projects that are longer-term and hopefully have research implications of use to the community. For any discussion on these, please use the existing Github issue (or make one). Develop a procedure to go from "How does Gunrock do on dataset X" to actually getting results and the right command lines for dataset X. Right now we do this manually with lots of iterations every time. We can automate and document this much better. Many apps have minimal documentation; we need better text when a user runs ./bin/primitive --help. How can we preprocess Gunrock input to increase performance? This could be either reordering CSR for better performance (e.g., reverse Cuthill-McKee) or a new format. How much locality is there in frontiers with respect to the "active" frontier vs. the entire set of vertices? Interesting visualization project, for instance: Get a list of the active vertices in a frontier as a function of iteration, so iteration 0 is vertex set A, iteration 1 is vertex set B, etc. For one iteration, visualize the vertex set as a color per chunk of vertices, say, 1024 vertices per pixel. If all 1024 vertices are part of that frontier, the pixel is white, if 0 black, and gray in between. Then each iteration makes another row of pixels. This shows three things: (a) how many vertices are in the frontier compared to not; (b) how much spatial locality there is; (c) how the frontier evolves over time. One of the goals of this effort would be to determine how useful it would be to do some reordering of vertices either statically or dynamically, and either locally (within a chunk of vertices) or globally. New primitives and better support for existing primitives. Unit-testing support through Googletest infrastructure. 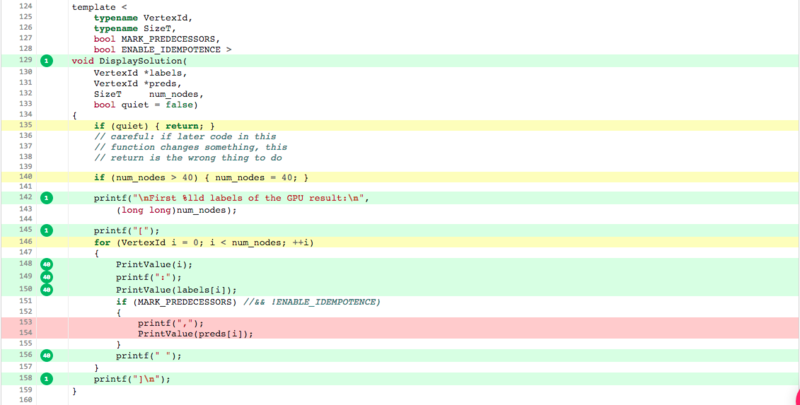 CPU reference code for correctness checking for some of the primitives. Support for central integration (Jenkins) and code-coverage. Overall bug fixes and support for new CUDA architectures. WTF has illegal memory access (https://github.com/gunrock/gunrock/issues/503). A* sometimes outputs the wrong path randomly (https://github.com/gunrock/gunrock/issues/502). Random Walk uses custom kernels within gunrock, this is resolved for future releases. CPU Reference code not implemented for SALSA, TC and LP (https://github.com/gunrock/gunrock/issues/232). Some of the most common questions we have come across during the life of Gunrock project. If your question isn't already answered below, feel free to create an issue on GitHub. Gunrock is a fast and efficient graph processing library on the GPU that provides a set of graph algorithms used in big data analytics and visualization with high performance. It also provides a set of operators which abstract the general operations in graph processing for other developers to build high-performance graph algorithm prototypes with minimum programming effort. Gunrock takes advantage of the immense computational power available in commodity-level, off-the-shelf Graphics Processing Units (GPUs), originally designed to handle the parallel computational tasks in computer graphics, to perform graph traversal and computation in parallel on thousands of GPU's computing cores. Gunrock is built with two kinds of users in mind: The first kind of users are programmers who build big graph analytics and visualization projects and need to use existing graph primitives provided by Gunrock. The second kind of users are programmers who want to use Gunrock's high-level, programmable abstraction to express, develop, and refine their own (and often more complicated) graph primitives. For the first kind of users, C/C++ background is sufficient. We are also building Gunrock as a shared library with C interfaces that can be loaded by other languages such as Python and Julia. For the second kind of users, they need to have the C/C++ background and also an understanding of parallel programming, especially BSP (Bulk-Synchronous Programming) model used by Gunrock. Using the exposed interface, the users do not need to know CUDA or OpenCL to modify or integrate Gunrock to their own tools. However, an essential understanding of parallel programming and BSP model is necessary if one wants to add/modify graph primitives in Gunrock. The study of social networks, webgraphs, biological networks, and unstructured meshes in scientific simulation has raised a significant demand for efficient parallel frameworks for processing and analytics on large-scale graphs. Initial research efforts in using GPUs for graph processing and analytics are promising. Most existing CPU large graph processing libraries perform worse on large graphs with billions of edges. Supercomputer or expensive clusters can achieve close to real-time feedback with high cost on hardware infrastructure. With GPUs, we can achieve the same real-time feedback with much lower cost on hardware. Gunrock has the best performance among the limited research efforts toward GPU graph processing. Our peak Edge Traversed Per Second (ETPS) can reach 3.5G. And all the primitives in Gunrock have 10x to 25x speedup over the equivalent single-node CPU implementations. With a set of general graph processing operators exposed to users, Gunrock is also more flexible than other GPU/CPU graph library in terms of programmability. Gunrock is an open-source library. The code, documentation, and quick start guide are all on its GitHub page. No. One can use either git clone or download directly to get the source code and documentation of Gunrock. Gunrock has three dependencies. Two of them are also GPU primitive libraries which also reside on GitHub. The third one is Boost (Gunrock uses Boost Graph Library to implement CPU reference testing algorithms). All dependencies do not require installation. To use, one only needs to download or git clone them and put them in the according directories. More details in the installation section of this documentation. For C/C++ programmer, integrating Gunrock into your projects is easy. Since it is a template based library, just add the include files in your code. The simple example and all the testrigs will provide detailed information on how to do this. For programmers who use Python, Julia, or other language and want to call Gunrock APIs, we are building a shared library with binary compatible C interfaces. It will be included in the soon-to-arrive next release of Gunrock. Gunrock is targeted at developers who are familiar with basic software engineering. For non-technical people, IT help might be needed. Currently, Gunrock has been tested on two Linux distributions: Linux Mint and Ubuntu. But we expect it to run correctly on other Linux distributions too. We are currently building a CMake solution to port Gunrock to Mac and Windows. The feature will be included in the soon-to-arrive next release of Gunrock. Testrigs are provided as well as a small simple example for users to test the correctness and performance of every graph primitive. On Linux, one only needs to go to the dataset directory and run "make"; the script will automatically download all the needed datasets. One can also choose to download a single dataset in its separate directory. Gunrock supports Matrix Market (.mtx) file format; users need to pre-process the graph data into this format before running Gunrock.